M.V. 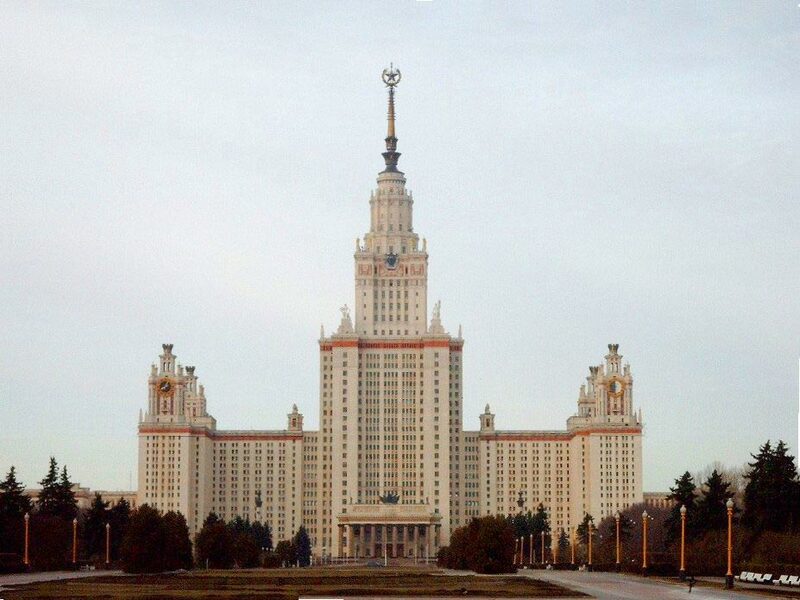 Lomonosov Moscow State University (often abbreviated MSU, MGU) is the largest and the oldest university in Russia, founded in 1755. As of 2004, the university has some 4,000 staff teaching 31,000 students and 7,000 postgraduates. Its current rector is Viktor Sadovnichiy. The university was established on the instigation of Ivan Shuvalov and Mikhail Lomonosov by a decree of Russian Empress Elizabeth dated January 25 (January 12 old style), 1755. First lessons were held on April 26. January 25 is still celebrated as the Students' Day in Russia. Originally allocated in the Principal Medicine Store on the Red Square, the university was transferred by Catherine the Great to the present Neoclassical building on the other side of the Mokhovaya Street. The main building was constructed between 1782 and 1793 to a Neo-Palladian design by Matvey Kazakov and rebuilt after Napoleon's invasion of Russia by Domenico Giliardi. 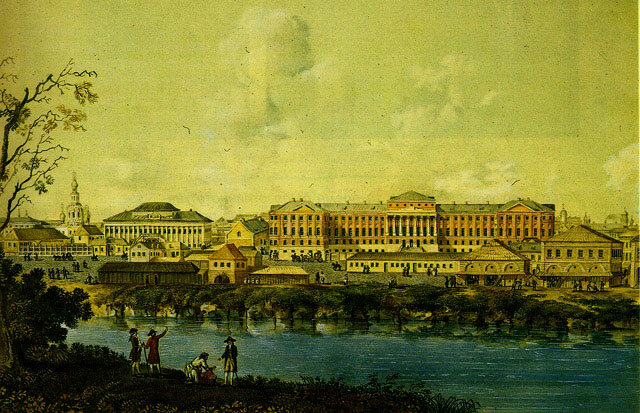 Moscow State University Main buildings of the university in the Mokhovaya Street, 1798. In the 18th century, the university included three departments - of philosophy, medicine, and law. A college for future students was affiliated with the university before being abolished in 1812. In 1779, Mikhail Kheraskov founded a board school for noblemen, transformed into a gymnasium for the Russian nobility in 1830. The university press, run by Nikolay Novikov in the 1780s, published the most popular newspaper in Imperial Russia - Moskovskie Vedomosti. In 1905 a social-democratic organization was created at the university, calling for the tsar to be overthrown and for Russia to be turned into a republic. The Tsarist government repeatedly began closing the university. In 1911, in a protest of the introduction of troops onto the campus and mistreatment of certain professors, 130 scientists and professors resigned en masse, including prominent ones such as Nikolay Dimitrievich Zelinskiy, Pyotr Nikolaevich Lebedev and Sergei Alekseevich Chaplygin. Thousands of students were expelled in 1911 as well. After the October Revolution in 1917, the school opened up to allow the children of the proletariat and peasants, not just those of the more well-to-do petits bourgeois. In 1919, tuition fees were done away with, and a preparatory facility was created for children of the working class so that they would be able to pass the admission examinations. The university was renamed in 1940 in honor of its founder Mikhail Lomonosov. After 1991 nine new departments were established. In 1992 the university has been granted a unique status: it is funded directly from the state budget (bypassing the ministry of education) which provides a significant level of independence. MSU Main Tower Since 1953 most of the departments are situated on Sparrow Hills, in the southwest of Moscow. The Main building was designed by architect Lev Vladimirovich Rudnev. 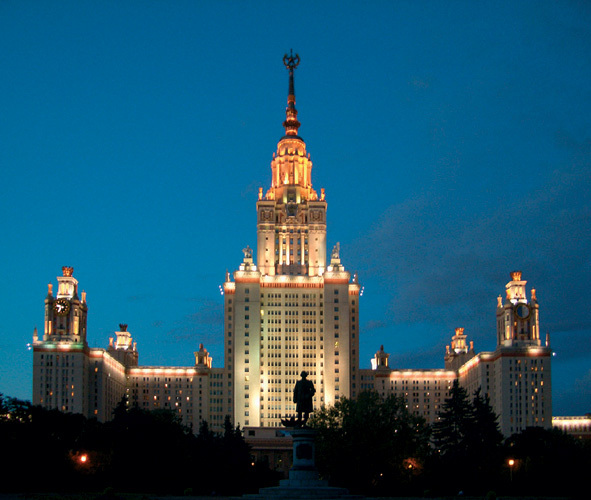 In the post-war era, Stalin ordered seven huge tiered neoclassic towers built around the city. The MSU Main building was by far the largest. It was also the tallest building in the world outside of New York City at that time, and it remained the tallest building in Europe until 1988. The central tower being 240m and 36-stories high, was flanked by four huge wings of student and faculty accommodations. It is said to contain a total of 33 kilometers of corridors and 5000 rooms. Facilities available inside the building include a concert hall, a theatre, a museum, various administration services, a library, a swimming pool, a police station, a post office, a laundry, a hairdresser's, a canteen, bank offices, shops, cafeterias, a bomb shelter, etc. Along with the university administration, four of the main departments - Department of Mechanics and Mathematics, the Department of Geology, the Department of Geography and the Department of Fine and Performing Arts - now remain in the Main buiding. The star on the top of the tower is large enough to provide a small room and a viewing platform; it weighs 12 tons. 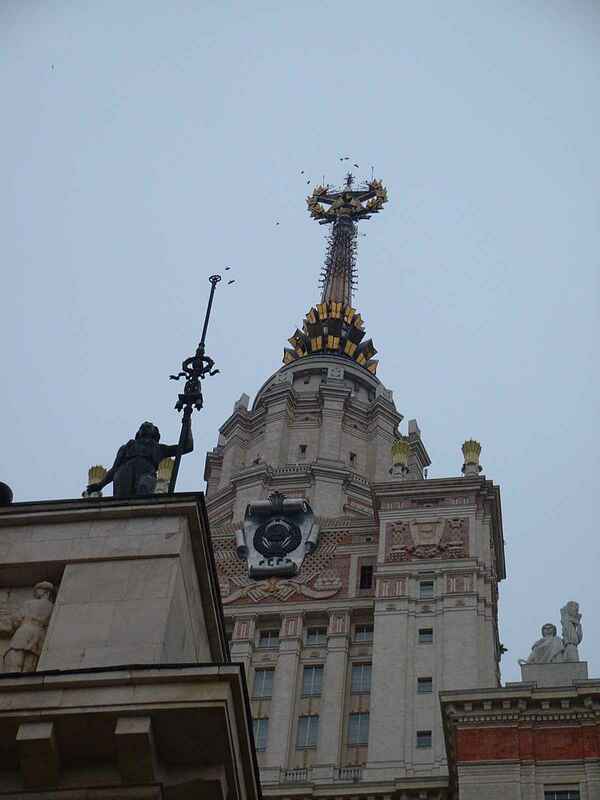 The building's facades are ornamented with giant clocks, barometers, and thermometers, statues, carved wheat sheaves and Soviet crests (recently renovated). It stands before a terrace featuring statues of male and female students gazing optimistically and confidently into the future. While the Sparrow Hills were on the outskirts of the city at the time of the construction of the Main building, they are now about halfway from the Kremlin to the city limits. Several other buildings and sport facilities were later added to the city campus, including the only specialized baseball stadium in Russia. Currently a new building is in construction for the social sciences departments, and a vast new facility has just been built for the library, which is the second biggest in Russia by the number of books. The university also has several dormitory buildings in the southwest of Moscow outside the campus. The historical buiding of the Mokhovaya Street now houses mainly the Department of Journalism, the Department of Psychology and the The Institute of Asian and African Studies.